Woke early as planned, in order to take full advantage of being in London at the crack of dawn. Slunk out of my hotel, and through the sleepy streets of Clapham - or indeed whatever the locals have decided to call this bit of contested domestic territory. Soon winding my way alongside the viaduct with the first trains of the day beginning to clank into life. Arrived at the deserted station entrance and booked some tickets at the machines. Nowhere to buy coffee this early, which wasn't a surprise - but hopefully I could rectify this omission at Victoria. The train was surprisingly well used and despite being a few minutes late, got me into Victoria Station in good time to get breakfast and board the train waiting to depart for Ramsgate. All very quiet on this service as we rattled over the complex of crossovers and made our way onto the Down Chatham Main which led us out of the city and over the suburban rooftops. The sun was just beginning to rise, and I felt very content to be scudding over the waking city. However, the scenery soon dissolved into the kind of green and dreary Kentish dullness which I've always found boring, and I was glad to reach the tangle of Medway towns and eventually Sittingboure. Here, it was a quick step across the platform for the waiting Sheerness-on-Sea unit. This was surprisingly busy, and we gained a few passengers at each of the intermediate stations as we crossed the flat, marshy landscape with the modern road bridge soaring above us. After passing intruiging sidings relating to the docks, eventually arrived at the surprisingly impressive terminus where equal numbers of commuters were waiting to get on. Sheepishly changed ends, trying not to look like a ned who's just gone 'there and back again' which I always think would be just about the worst a guard could think of me! Once back at Sittingbourne and fuelled with further coffee, the plan was to use a complex sequence of changes to get the last of the three parallel 'North Kent' lines which fan out from London Bridge. The last one for me was the most southerly route, via Crayford. This involved a little new track first of all from Chatham to Darftord via Hoo Junction, then a longer stretch of mainly suburban track which while not scenic or particularly interesting in many ways, was a major goal for me! This left only the slight niggle of the loop avoiding Dartford at the eastern end of the line - but that would have to wait. A brief break and a chance to rebook at London Bridge, before boarding the very lightly loaded shuttle to Beckenham Junction. This followed familiar territory until it reached Crystal Palace, where the line soars over the busy lines to East Croydon and curves alongside the Wimbledon Tramlink line which I'd covered a few months back. The trams take up half of the former rail alignment, leaving this rather forlorn branch to arrive into a bay platform at Beckenham Junction. Enviously eyed the rare curve to New Beckenham on the Hayes Line - which had been used recently it seems - before heading back into the city once again. Having been travelling for well over six hours, decided to walk the next bit. Out of London Bridge and over the river to nearby Monument Station, where the Circle Line took me to Tower Hill for a further short walk to Fenchurch Street via familiar city byways. Always interesting to visit this station, as it's something of a backwater and is somewhere I rarely need to use. Arrived just in time to purchase a ticket and board my planned train to Upminster. Enjoyed the busy but not crowded atmosphere on the train, and was also intrigued to note a fair number of GBRf locos on 'Metronet' renewal duties on the currently closed District Line tracks. The work carried on into Upminster station where the centre island had become a stores site. Made my way over to the furthest flung platform which serves the curious little disconnected branch to Romford. The 315 arrived and a small band of passengers disembarked, allowing an equally insignificant amount to board in their place. 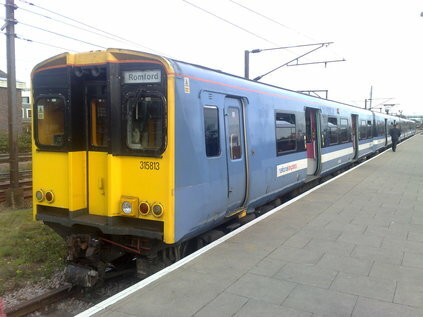 A short, leafy and uneventful low-speed trundle followed, arriving at a bay platform seemingly a short walk from the rest of Romford station. Grabbed a quick snap of the unit once all my fellow passengers had shuffled off, before dashing over to a crowded platform to wedge myself into the next stopping unit to Liverpool Street. Found myself squashed and crushed, feeling guilty for taking up so much space - and worse still, seated across from possibly one of the most arrestingly beautiful women I've ever seen. Tried not to stare, as the rather maudlin looking, dark-eyed Middle Eastern individual clearly didn't speak a great deal of English, and a fat sweaty trainspotter with a couple of days of accumulated carriage-grime clinging to him probably wasn't high on her list of 'must see' sights for her visit to London! Quite how she and her group managed to end up boarding a train in Ilford is cause for concern in itself. Unfolded myself at Liverpool Street, and almost immediately squashed back onto another 315. Somehow these trains lack space - so that even if alone in a carriage one feels somehow constricted and squished. This helped my resolve to change the plan slightly at the next stop and to do a little more walking. 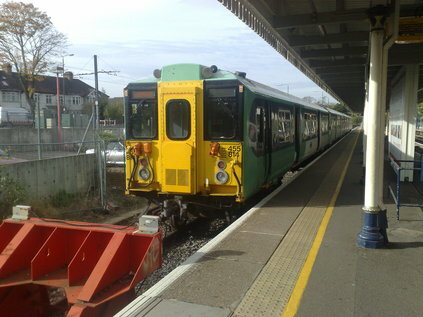 This train however covered some more undone track in the shape of the branch to Enfield Town. A fairly interesting but uneventful ride along the now familiar route via the Lea Valley and following the line through the wonderfully oddly named Turkey Street before taking the branch into Enfield. Here I'd resolved to make the apparently quick and easy walk to Enfield Chase on the suburban lines to Kings Cross. Immediately out of the station I crossed the road, and once again came face to face with The New River, emerging oddly from under a small bridge. This apparently was a 'disused loop' and the river had been straightened, marooning this ancient stretch. Marvelled that my visits to remaining lines north of the Thames had repeatedly brought me back to this river of which I knew little North of Clerkenwell and Pentonville. 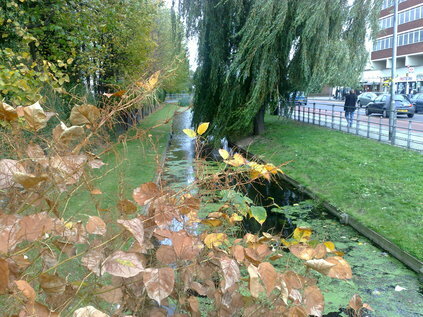 The New River at Enfield, pretty straight for a 'loop'! As I trudged rather wearily up to Enfield Chase station I encountered the river once again as it completed its loop around the town, and spent some time watching the world go by before the rain started to fall, and drove me into the station. Booked once again, with a quick thought about how this trip was whittling away at my reserves slowly and surely. Eventually, a reasonably filled Class 313 trundled in, and I set off back to Kings Cross in thoughtful mood. I could have crossed the city and finished my day's wanderings here in the knowledge I'd covered lots of bits of track which would have taken weeks of trips back and forth - but I couldn't quite bring myself to give in just yet. The thought of the short curve near Dartford which I'd passed-by earlier returned. Made a swift dash across town to Cannon Street, and messed around trying to force cash into a card only machine for long enough to almost miss a train billed as heading for Slade Green. If my calculations were correct, this train would turn back towards the city via the curve to Crayford. Settled in to the Class 376, wishing we had a similarly simple and spacious commuter unit back in the West Country. Again a fairly uneventful but initially very busy run via Greenwich and Slade Green before taking the unremarkable curve which had become the focus of my trip! Decided to work my way back to the hotel via a series of changes at Hither Green and Lewisham, bringing me back to Victoria and thence to Clapham. Today turned out to be something of a marathon - and whilst it didn't do quite the track which had been planned for the railtour which was cancelled, I managed to cover huge amounts of the city's remaining new track. I also got to consider further how I approach the changes in the North East of the city - and I can feel new projects on the horizon...these trips are never entirely simple.